BUTTER DISH IS IN VERY GOOD CONDITION – IT HAS A ¼” SLICED TYPE DING ON INSIDE EDGE OF TOP – NOT AT ALL DETRIMENTAL BUT I HAVE PRICED TO REFLECT THIS IMPERFECTION. BUTTER DISH IS IN EXCELLENT CONDITION WITH TYPICAL MCFLAWS. THERE’S A 5/16” NON-COLOR/NON-GLAZE AT EDGE OF TOP – CAN SEE IT IN PHOTO AND IT’S NOT DAMAGE, JUST NON-COLOR. THERE’S A ¼” PRODUCTION STRESS ON BOTTOM DRY (SETTING) RING) -- THAT’S IT! THERE IS NO “USE” EVIDENCE AT ALL!! 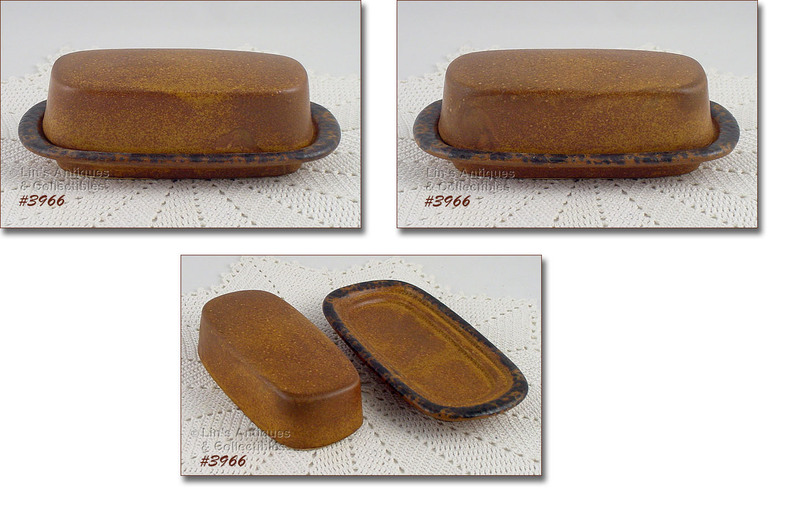 THIS LISTING HAS A COVERED BUTTER DISH FROM MCCOY’S CANYON DINNERWARE LINE! BOTTOM IS MARKED: MCCOY, 7013, USA. 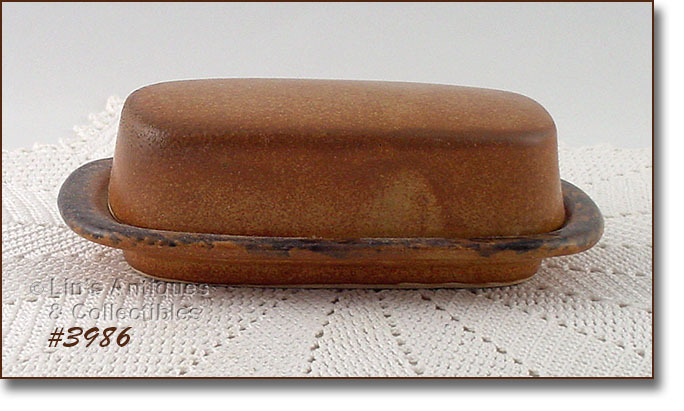 BUTTER DISH HAS BEAUTIFUL RUSH COLOR AND IS IN WONDERFUL CONDITION. THERE IS A TEENY DING (1/16”) AT ONE END WHERE THE SPATTER BEGINS – REALLY TEENY AND IS NOT DETRIMENTAL, HOWEVER, I HAVE PRICED TO REFLECT THIS SMALL IMPERFECTION. 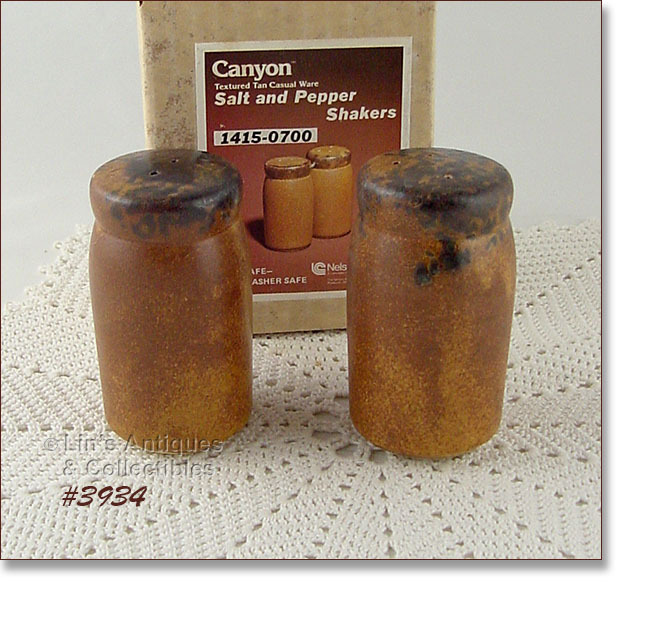 THIS LISTING HAS A McCOY CANYON SALT AND PEPPER SHAKER SET STILL IN THE ORIGINAL BOX! SET IS MINT CONDITION! 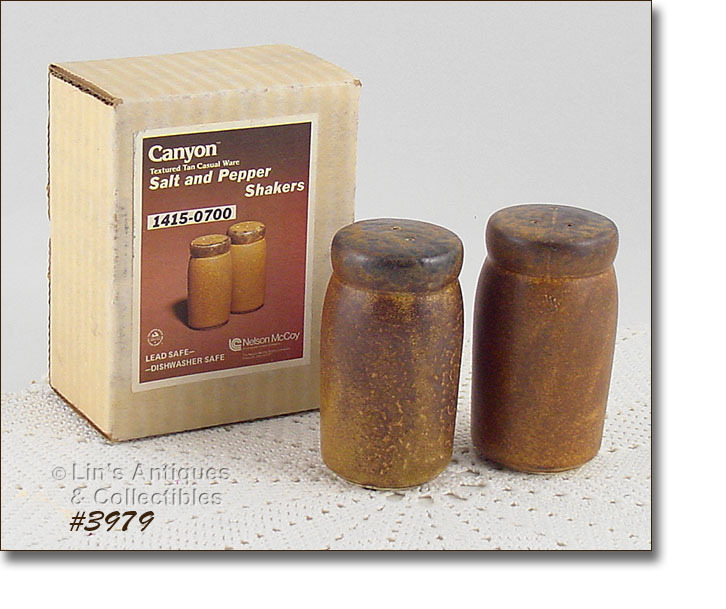 THIS IS ONLY THE SECOND SET OF THESE McCOY CANYON “STUBBY” SHAKERS I’VE HAD IN INVENTORY – THEY ARE VERY DIFFICULT TO FIND! 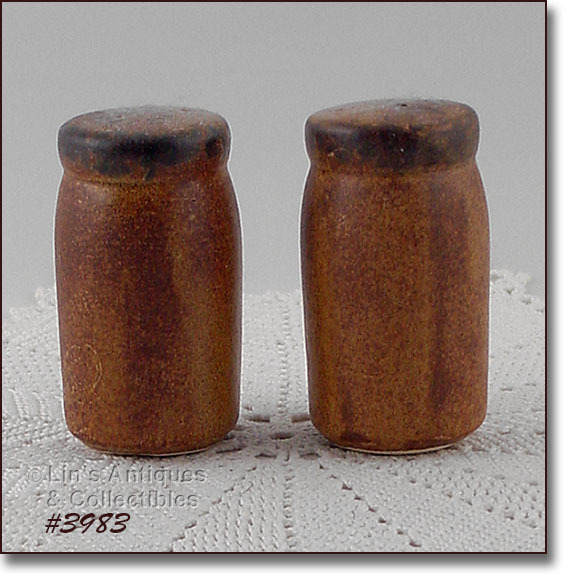 SHAKERS MEASURE 2 /18” TALL AND HAVE THE MORE DIFFICULT TO FIND SMOOTH (NOT TEXTURED) GLAZE/FINISH. THE SET LOOKS NEW AND UNUSED – EVEN HAVE THE ORIGINAL ORANGE COLOR PLASTIC STOPPERS. THERE IS NO EVIDENCE OF “USE” – I NOTICED A COUPLE TYPICAL MCFLAWS IN GLAZE/COLOR – THAT’S IT! SUPER ADDITION TO A CANYON COLLECTION! 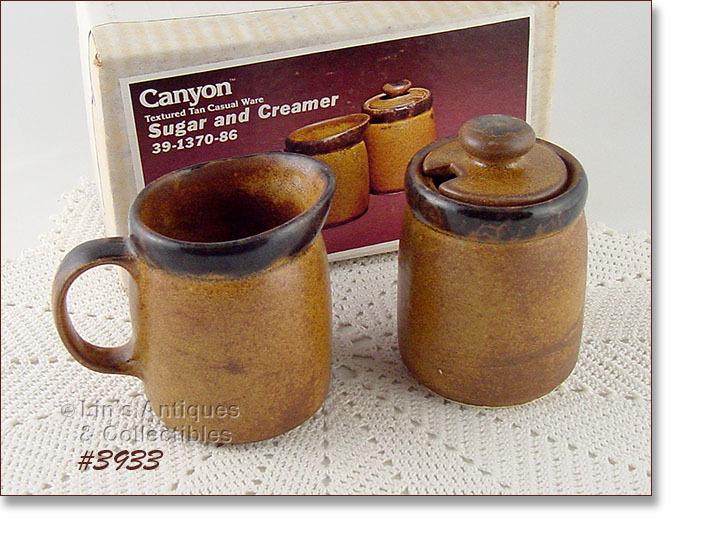 THIS LISTING HAS A CREAMER AND SUGAR WITH LID FROM McCOY’S PRETTY CANYON DINNERWARE LINE! PIECES ARE MARKED 1414, McCOY, USA AND ARE IN EXCELLENT CONDITION WITH TYPICAL GLAZE/COLOR VARIANCES. THESE PIECES HAVE THE MORE DIFFICULT TO FIND SMOOTH (NOT TEXTURED) GLAZE FINISH. VERY NICE! PRETTY COLORS ON THIS McCOY TEAPOT! THIS ONE IS FROM THE PRETTY CANYON DINNERWARE LINE AND BOTTOM IS MARKED 1418, McCOY, LANCASTER COLONY (MARK), USA. IT HAS SOME TYPICAL McFLAWS – PRODUCTION GLAZE IRREGULARITIES, ETC – NOTHING DETRIMENTAL. THE ONLY EVIDENCE OF “USE” IS A TEENY, TEENY DING ON UPPER EDGE – AGAIN NOT DETRIMENTAL. VERY NICE ITEM, PRICED TO REFLECT THE TEENY DING. 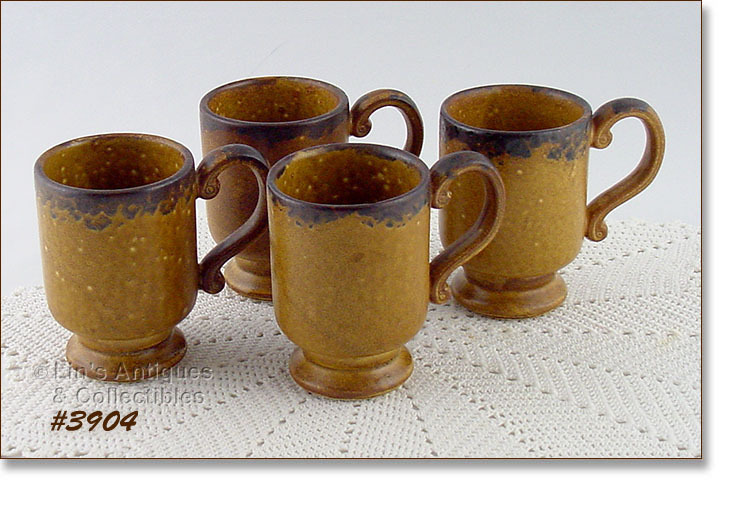 THIS LISTING HAS A SET OF 4 PEDESTAL STYLE MUGS FROM McCOY’S CANYON DINNERWARE LINE! 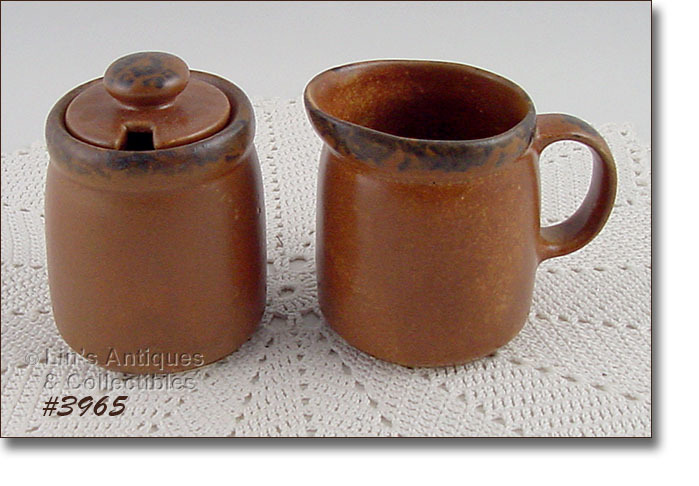 MUGS MEASURE 4 ¼” TALL AND BOTTOMS ARE MARKED: McCOY, LANCASTER COLONY (MARK), USA. ALL ARE IN EXCELLENT CONDITION WITH A FEW TYPICAL McFLAWS (PIN-POPS, IRREGULAR COLOR/GLAZE, ETC) – NOTHING UNUSUAL AND NOTHING DETRIMENTAL. 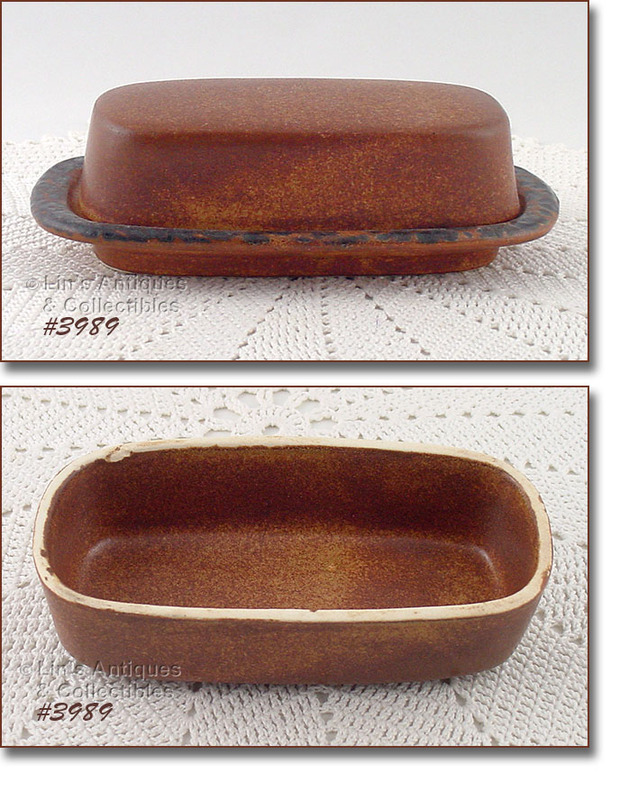 THIS LISTING HAS A SET OF 4 INDIVIDUAL SIZE CASSEROLES FROM MCCOY’S CANYON DINNERWARE LINE! THESE ARE THE FRENCH STYLE CASSEROLES (STICK TYPE HANDLES) AND BOTTOMS ARE MARKED 7054, MCCOY, LANCASTER COLONY (MARK), USA. WHEN I SAW THESE CASSEROLES, I COULDN’T RESIST PURCHASING THEM BECAUSE THEY’RE QUIRKY AND DEFINITELY CONVERSATIONS STARTERS DUE TO THEIR SHAPE! APPARENTLY ALL CAME FROM THE SAME MOLD OR THE SAME POTTER MADE THEM – THEY ARE OVAL SHAPED AT TOP OPENING INSTEAD OF ROUND SHAPED! THEY ARE IN EXCELLENT CONDITION AND ACTUALLY APPEAR UNUSED – SUPER! 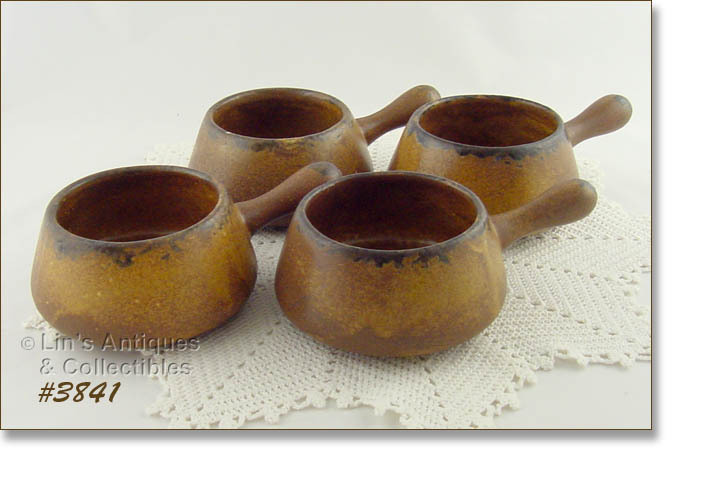 THIS LISTING HAS A SET OF 4 SOUP BOWLS FROM MCCOY’S CANYON DINNERWARE LINE! BOWLS MEASURE 2 ¾” TALL, 5 ¾” LONG (END OF HANDLE TO END OF HANDLE), AND THE BOWL IS 3 ¾” DIAMETER. BOTTOMS ARE MARKED MCCOY, LANCASTER COLONY (MARK), USA. 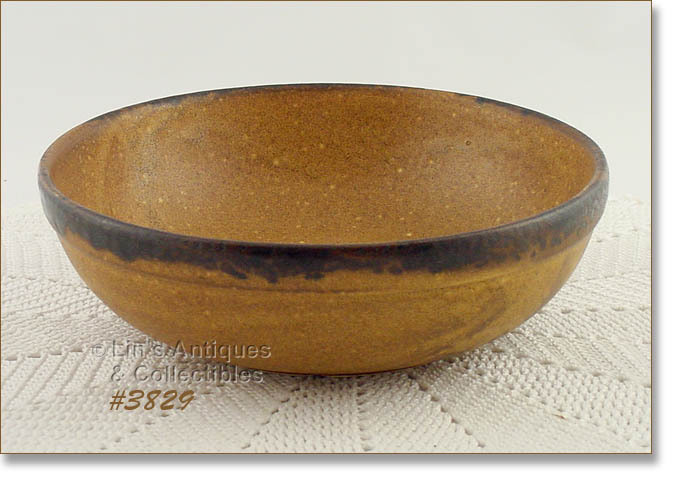 BOWLS ARE IN EXCELLENT CONDITION AND HAVE VERY PRETTY GOLDEN/RUST COLOR. VERY PRETTY COLORS ON THIS MCCOY CANYON CREAMER AND COVERED SUGAR! THEY HAVE THE DARKER RUST COLOR AND BOTH ARE IN WONDERFUL CONDITION. THEY HAVE NO “USE” EVIDENCE BUT DO HAVE SOME PRODUCTION GLAZE IMPERFECTIONS. 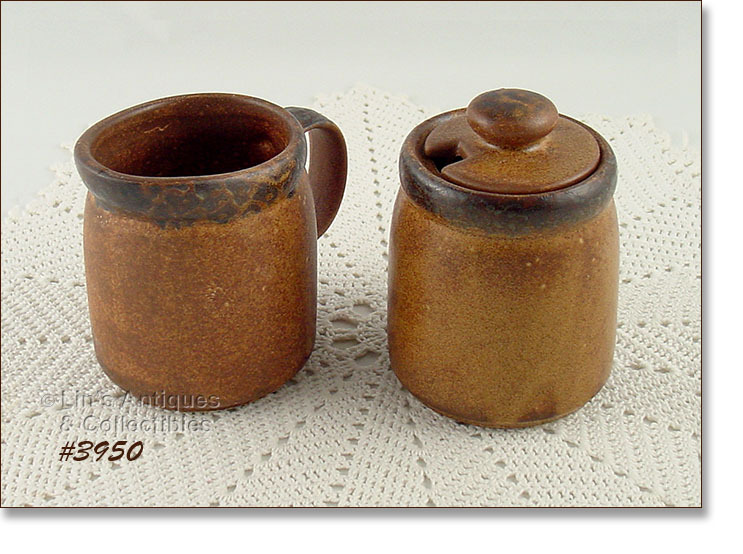 THE CREAMER HAS ROUGH GLAZE ON THE HANDLE AND SUGAR HAS SOME NON-COLOR/GLAZE DOTS – THESE ARE PRODUCTION. CREAMER IS MARKED 1414, USA. SUGAR IS MARKED 1414, MCCOY, USA. NICE SET, NICELY PRICED. EXCELLENT CONDITION McCOY SERVING PLATTER FROM THE PRETTY CANYON DINNERWARE LINE! 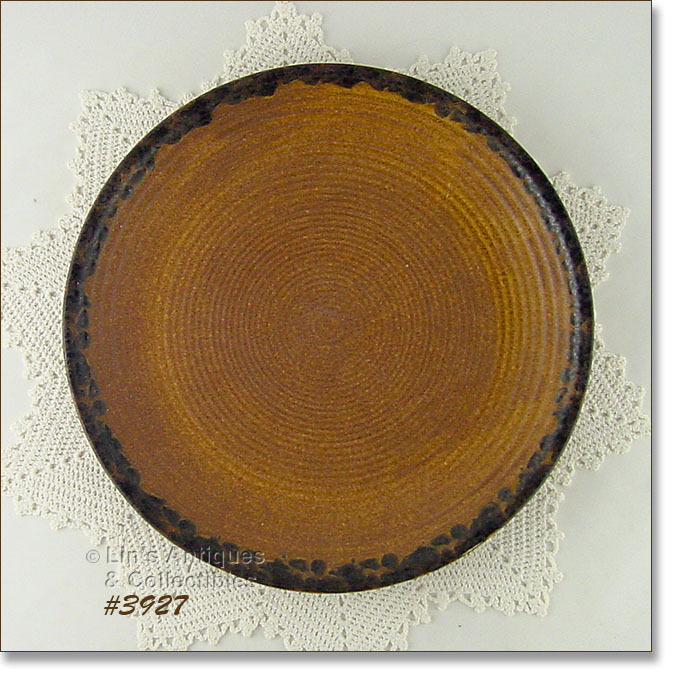 MEASURES 12¼” DIAMETER, MARKED USA ON BACK, AND HAS THE CONCENTRIC CIRCLES DESIGN/PATTERN. 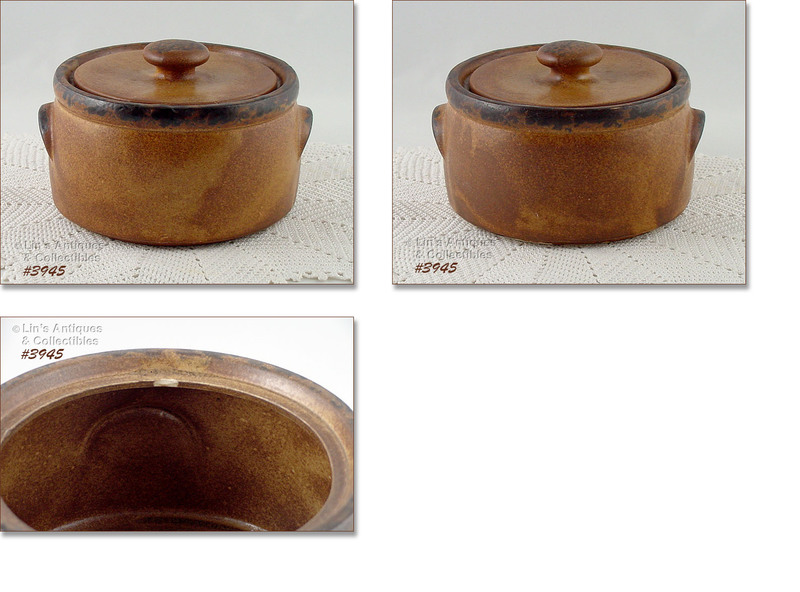 THIS LISTING HAS A COVERED CASSEROLE FROM McCOY’S PRETTY CANYON DINNERWARE LINE! VERY PRETTY COLORS AND BOTTOM IS MARKED 1421, McCOY, LANCASTER COLONY (MARK), USA. LID IS IN EXCELLENT CONDITION, CASSEROLE IS IN VERY GOOD CONDITION – THERE IS A ½” SLICE TYPE DING ALONG INSIDE RIM – SEE PHOTO. THIS DING IS NOT DETRACTING TO USE OR APPEARANCE BUT IT IS THERE AND CASSEROLE IS PRICED TO REFLECT THIS IMPERFECTION. THIS LISTING HAS A McCOY DINNERWARE SERVICE FOR 4! IT’S THE PRETTY CANYON DINNERWARE AND CONSISTS OF 20 PIECES – THERE ARE 4 DINNER PLATES, 4 BREAD/DESSERTS, 4 CEREAL/SALAD BOWLS, 4 SAUCERS AND 4 CUPS. ALL ARE IN EXCELLENT CONDITION WITH NO DINGS, CHIPS, OR CRACKS. AS WITH MOST CANYON ITEMS, THERE ARE TYPICAL PRODUCTION VARIANCES IN COLOR/GLAZE. NICE SET! VERY PRETTY COLORS ON THIS SERVING BOWL FROM MCCOY’S CANYON DINNERWARE LINE! 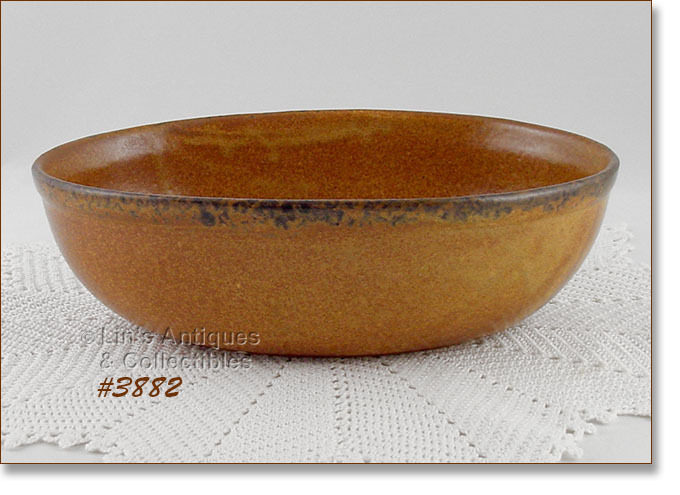 THIS IS THE OVAL SHAPED BOWL, MEASURES 10 ½” LONG, 6 ½” WIDE, 3 ¼” TALL, AND BOTTOM IS MARKED 1425, MCCOY, LANCASTER COLONY (MARK), USA. 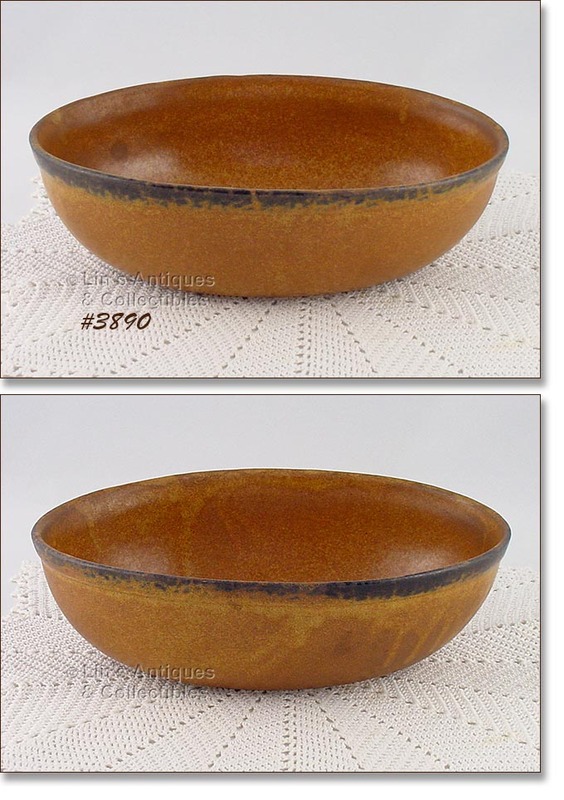 THIS BOWL HAS SOME COLOR RUBS/NON-GLAZE PLACES ON BOTTOM (UNDERNEATH) AND THE DRY RING HAS A ¼” DING THAT COULD BE PRODUCTION BECAUSE THIS BOWL APPEARS UNUSED BUT HAS MCFLAWS (THE COLOR RUBS AND THE BOTTOM INTERIOR HAS SOME NON-COLOR DOTS – SEE PHOTOS). 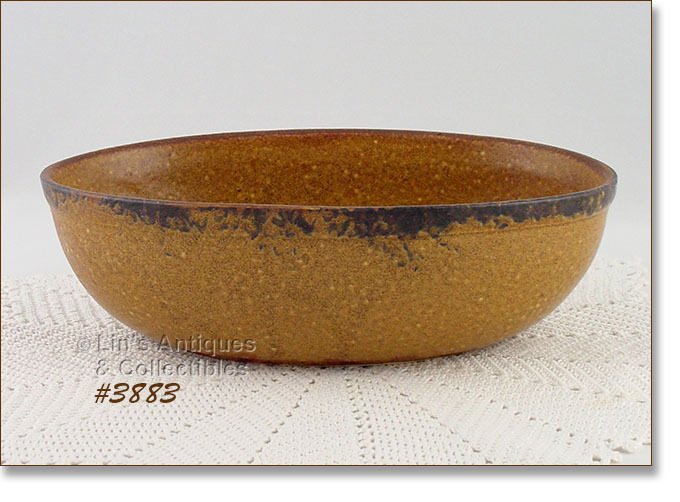 THIS IS A VERY NICE BOWL, VERY USABLE BUT IT DOES HAVE SOME TYPICAL MCCOY PRODUCTION BLEMISHES AND FLAWS – PRICED TO REFLECT THESE IMPERFECTIONS! 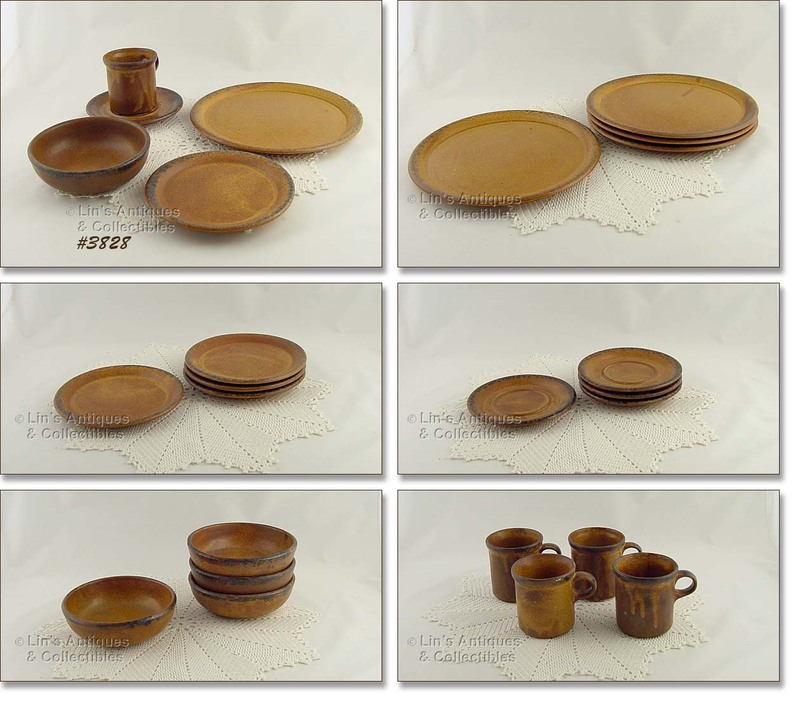 THIS LISTING HAS A McCOY SHAKER SET FROM THE PRETTY CANYON DINNERWARE LINE! SHAKER SET IS MINT IN THE ORIGINAL BOX. I OPENED THE BOX TO VERIFY ITEM CONDITION AND IT IS NEW!! ANOTHER MINT IN ORIGINAL BOX McCOY CANYON DINNERWARE ITEM! THIS IS A CREAMER AND SUGAR WITH LID. I OPENED THE BOX TO VERIFY ITEM CONDITION AND IT IS NEW! MINT IN ORIGINAL BOX McCOY CANYON CREAMER AND COVERED SUGAR! I OPENED THE BOX TO VERIFY ITEM CONDITION AND IT IS NEW!!! 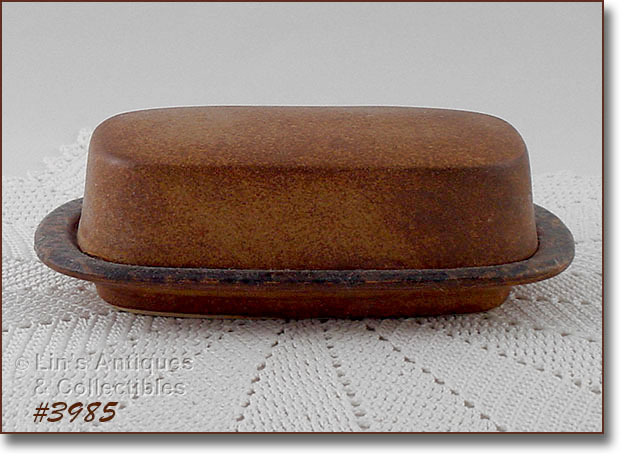 THIS LISTING HAS A MINT IN ORIGINAL BOX McCOY COVERED BUTTER DISH! IT IS FROM THE PRETTY CANYON DINNERWARE LINE. I OPENED THE BOX TO VERIFY ITEM CONDITION AND IT IS NEW! 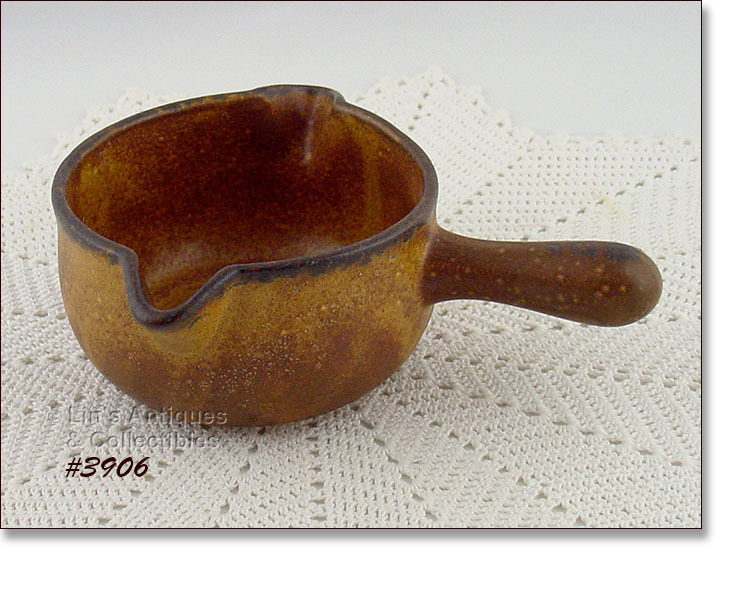 EXCELLENT CONDITION GRAVY SERVER FROM McCOY’S CANYON DINNERWARE LINE! MEASURES 9” (END TO END), 4 ¾” WIDE (AT CENTER), AND 2 ¾” TALL. BOTTOM IS MARKED: 7028, McCOY, LANCASTER COLONY (MARK), USA. SERVER HAS COLOR VARIANCES – TYPICAL McCOY – AND THESE ARE ESPECIALLY EYE-CATCHING (SEE PHOTOS). SUPER ITEM! WHAT A FIND – A RARE McCOY CANYON SERVING PLATTER! I HAVE ONLY SEEN TWO OF THIS DESIGN IN THE CANYON LINE AND I WAS FORTUNATE ENOUGH TO PURCHASE BOTH! PLATTER MEASURES 13 ¼” (END TO END) AND 10” WIDE, BOTTOM IS MARKED 7062, McCOY, LANCASTER COLONY (MARK), USA AND IT IS IN EXCELLENT CONDITION. THE COLOR IS BEAUTIFUL – THE MORE GOLDEN RUST COLOR – SUPER ADDITION TO A CANYON COLLECTION! GORGEOUS COLORS ON THIS McCOY CANYON PLATTER OR CHOP PLATE! THIS ONE HAS THE CONCENTRIC CIRCLE DESIGN, MEASURES 12” DIAMETER, AND IS IN EXCELLENT CONDITION WITH NO EVIDENCE OF “USE”. 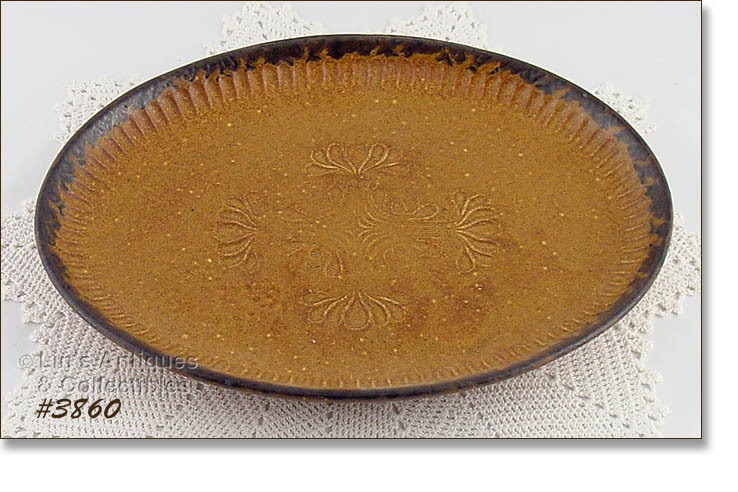 PLATTER HAS TYPICAL McCOY COLOR VARIANCES, COLOR RUBS/NON-GLAZE, ETC. – PRODUCTION AND NOT DETRIMENTAL. VERY PRETTY! THIS LISTING HAS A SET OF 4 CASSEROLES FROM McCOY’S PRETTY CANYON DINNERWARE LINE! THESE ARE THE INDIVIDUAL SIZE CASSEROLES WITH THE MORE FLAT SHAPED HANDLE AND ARE A RICH RUST COLOR WITH THE SMOOTH (NOT TEXTURED) GLAZE. BOTTOMS ARE MARKED: 7050, McCOY, LANCASTER COLONY (MARK), USA. THEY ARE IN EXCELLENT CONDITION WITH NORMAL COLOR VARIANCES, ETC – THEY HAVE NO “USE” EVIDENCE. NEAT ITEMS THAT ARE BECOMING DIFFICULT TO FIND! 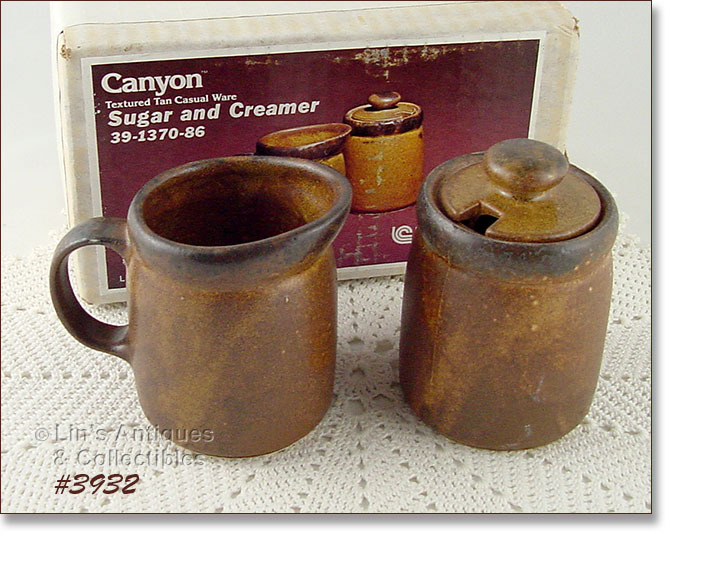 THIS LISTING HAS A SMALL SIZE CANISTER FROM MCCOY’S PRETTY CANYON DINNERWARE LINE! IT MEASURES 5 ¼” TALL TO RIM AND BOTTOM IS MARKED 1420S, MCCOY, LANCASTER COLONY (MARK). IT’S IN EXCELLENT CONDITION WITH VERY PRETTY COLOR. EXCELLENT CONDITION PITCHER FROM MCCOY’S CANYON DINNERWARE LINE! PITCHER MEASURES 6 ¾” TALL AND BOTTOM IS MARKED 1429, MCCOY, LANCASTER COLONY (MARK), USA. SUPER! 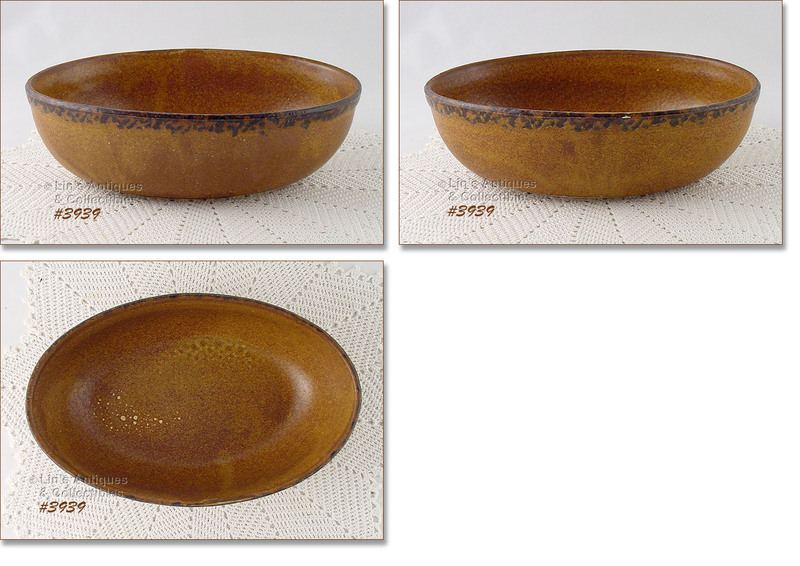 THIS MCCOY CANYON DINNERWARE LISTING HAS AN OVAL SHAPED SERVING BOWL! IT MEASURES 10 5/8” LONG (AT LONGEST), 6 ½” WIDE (AT WIDEST), AND 3 ¼” TALL. BOTTOM IS MARKED 1425, MCCOY, LANCASTER COLONY (MARK), USA. BOWL HAS NO EVIDENCE OF USE – ACTUALLY LOOKS NEW AND UNUSED – BUT IT HAS A COUPLE TYPICAL PRODUCTION FLAWS. THERE IS COLOR RUB ON BOTTOM EDGE AND SOME UNDER-GLAZE DOTS – THESE ARE PRODUCTION AND OF ABSOLUTELY NO CONSEQUENCE, JUST TYPICAL MCFLAWS! 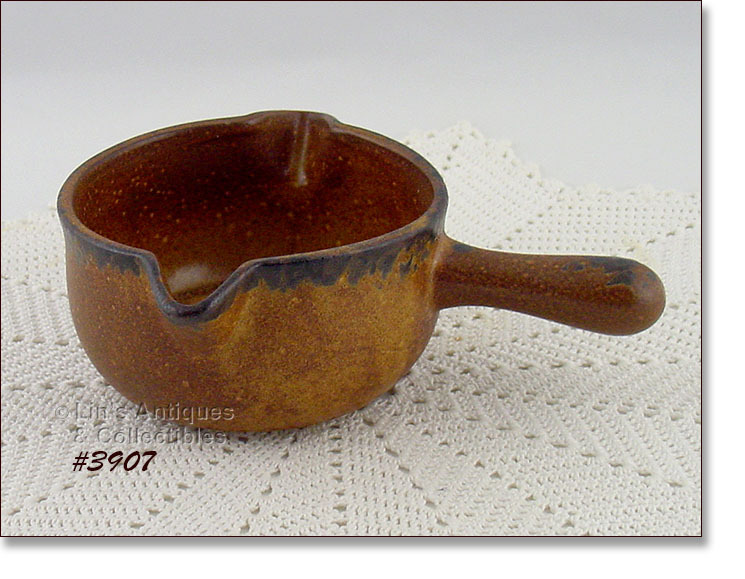 THIS LISTING HAS AN EXCELLENT, LIKE NEW CONDITION GRAVY SERVER / BOWL FROM MCCOY’S CANYON DINNERWARE LINE! 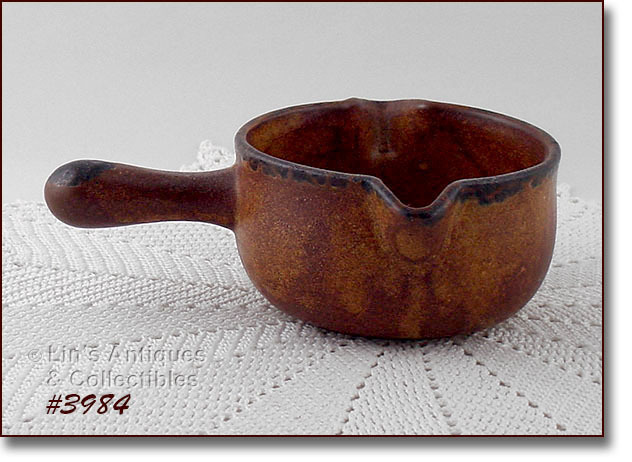 IT MEASURES 2 ½” TALL, 6” DIAMETER (POURING LIP TO LIP), AND BOTTOM IS MARKED 1428, MCCOY, LANCASTER COLONY (MARK), USA. GORGEOUS COLOR! THIS LISTING HAS 4 MCCOY PEDESTAL CUPS FROM THE PRETTY CANYON DINNERWARE LINE! AS MOST OF YOU KNOW, I SELDOM USE THE WORD “RARE” TO DESCRIBE MCCOY ITEMS BUT THESE CUPS ARE JUST THAT, RARE. THEY ARE THE ONLY SET I HAVE EVER SEEN LIKE THESE IN THE CANYON DINNERWARE LINE! 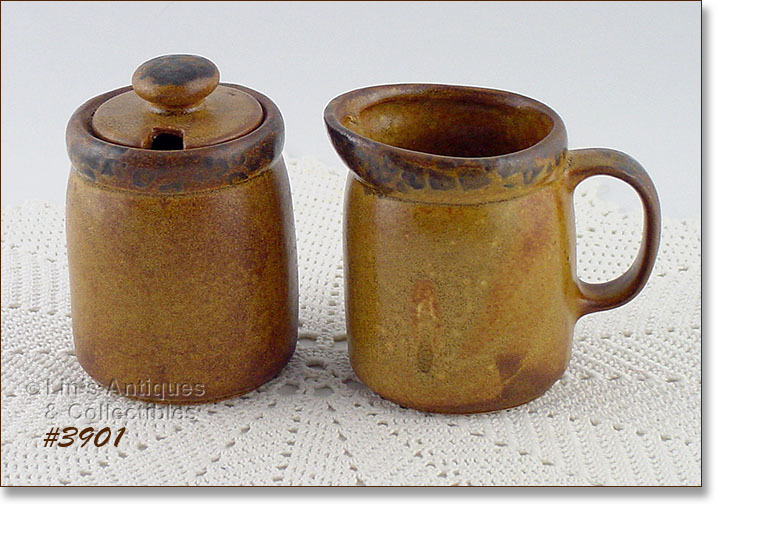 CUPS MEASURE 4” TALL AND BOTTOMS ARE MARKED: 1085, MCCOY, LANCASTER COLONY (MARK), USA. PLEASE NOTE THAT THE NUMBERS ARE SMALL AND DIFFICULT TO SEE BUT I BELIEVE THEY ARE 1085. ALL 4 CUPS ARE IN EXCELLENT CONDITION – THEY ACTUALLY APPEAR NEW AND UNUSED! EXCELLENT CONDITION MCCOY TEAPOT FROM THE PRETTY CANYON DINNERWARE LINE! BOTTOM IS MARKED 1418, MCCOY, LANCASTER COLONY (MARK), USA. 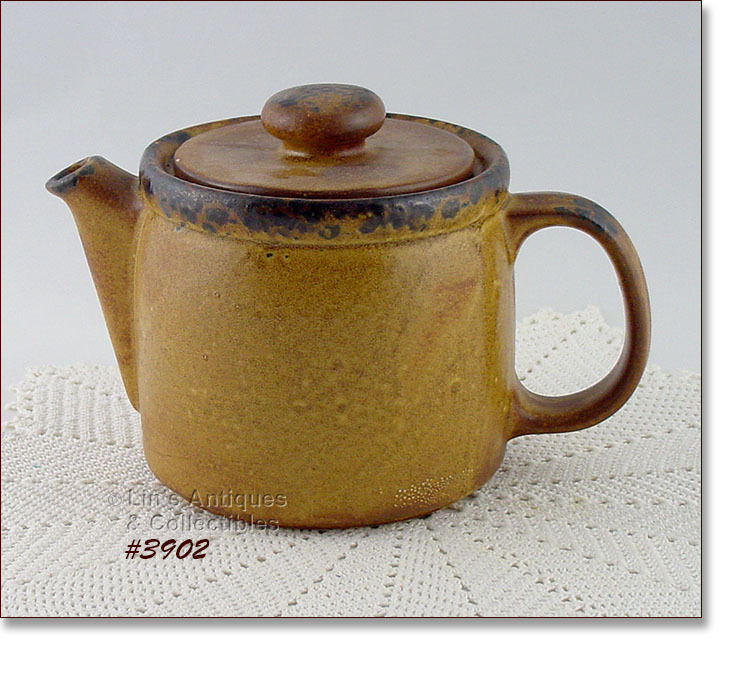 TEAPOT HAS TYPICAL MCFLAWS – NON-GLAZED/COLOR DOTS (ONE ON LID EDGE AND ON POUR SPOUT) – ABSOLUTELY NOT DETRIMENTAL. THERE ARE ALSO SOME GLAZE DOTS/GRAINS ON SIDE – AGAIN, PRODUCTION AND NOT DETRIMENTAL! VERY NICE TEAPOT WITH LOVELY COLORS! SUPER CONDITION MCCOY CREAMER AND COVERED SUGAR! SET IS FROM THE PRETTY CANYON DINNERWARE LINE. CREAMER IS MARKED 1414, USA. SUGAR IS MARKED 1414, MCCOY, USA. CREAMER HAS A ¼” SLICE TYPE CHIP IN THE BOTTOM DRY RING – THAT’S IT AND IT’S NOT DETRIMENTAL! CREAMER IS MARKED 1414, USA, SUGAR IS MARKED 1414, MCCOY, USA. LOVELY COLORS ON THIS SET! 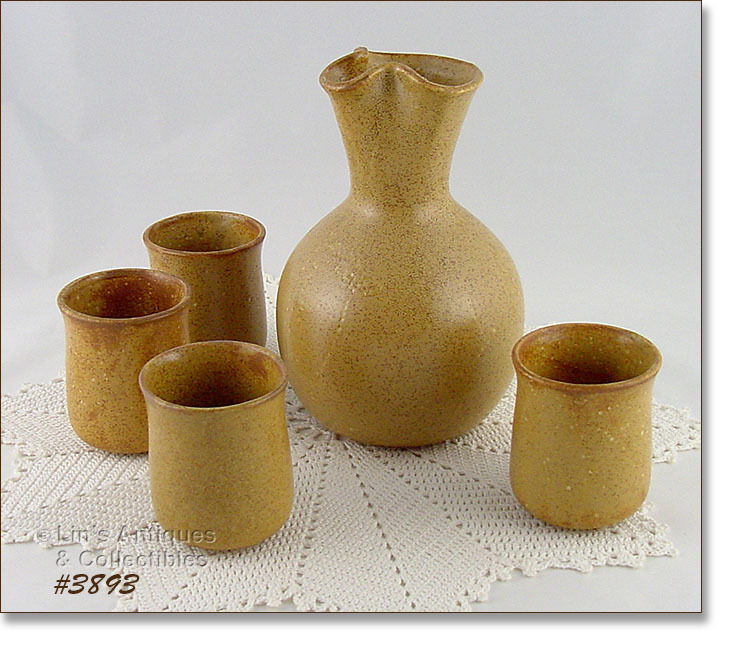 THIS IS A NEAT ITEM – A DECANTER AND 4 CUPS/GLASSES FROM MCCOY’S CANYON DINNERWARE LINE! THE COLOR IS THE MORE YELLOW/GOLD COLOR INSTEAD OF RUST COLOR. CUPS HAVE TYPICAL PRODUCTIONS COLOR VARIANCES AND ARE MARKED 659, MCCOY, USA. DECANTER HAS TYPICAL MCFLAWS – PIN-POPS AND HAS A VISIBLE MOLD LINE – PRODUCTION, NOTHING DETRIMENTAL! VERY NICE SET, NOT YOUR EVERYDAY FIND. EXCELLENT CONDITION COVERED MARGARINE CONTAINER FROM MCCOY’S CANYON DINNERWARE LINE! BOTTOM IS MARKED MCCOY, LANCASTER COLONY (MARK), USA. GORGEOUS COLORS! 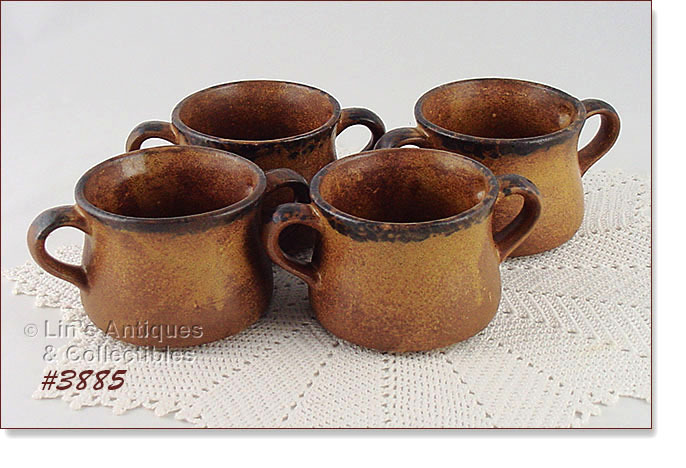 THIS LISTING HAS A SET OF 4 SOUP MUGS/BOWLS FROM MCCOY’S CANYON DINNERWARE LINE! BOWLS ARE MARKED MCCOY, LANCASTER COLONY (MARK), USA AND ARE IN EXCELLENT CONDITION WITH NO “USE” EVIDENCE. SUPER! EXCELLENT CONDITION MCCOY COVERED BUTTER DISH! THIS ONE IS FROM THE PRETTY CANYON DINNERWARE LINE AND IT ACTUALLY LOOKS NEW AND UNUSED! EXCELLENT CONDITION SHAKER SET FROM MCCOY’S CANYON DINNERWARE LINE! 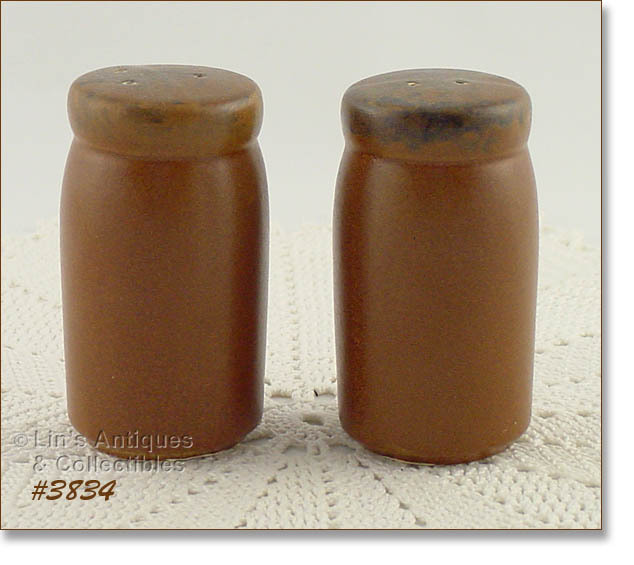 SHAKERS MEASURE 3 ¾” TALL AND HAVE THE ORIGINAL STOPPERS. SUPER SET – LOOKS NEW! 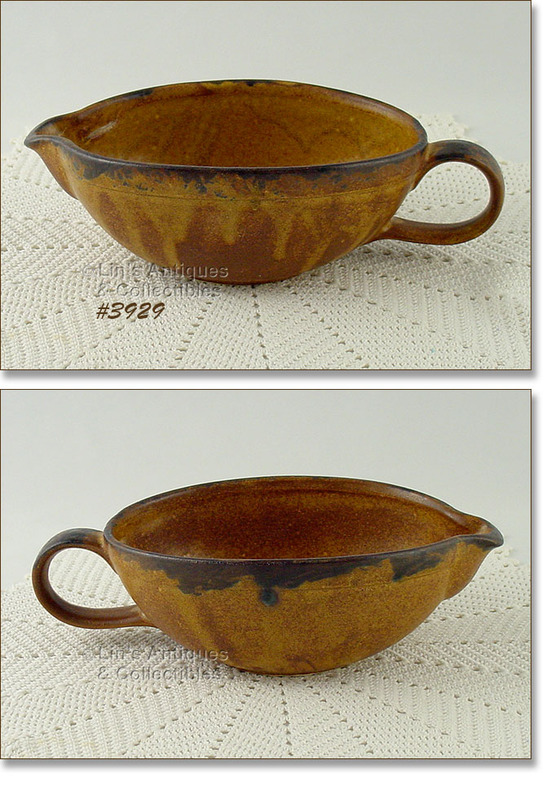 THIS LISTING HAS TWO MUGS FROM MCCOY’S CANYON DINNERWARE LINE! THEY DO NOT HAVE ANY EVIDENCE OF “USE” BUT DO HAVE SOME PRODUCTION IMPERFECTIONS. 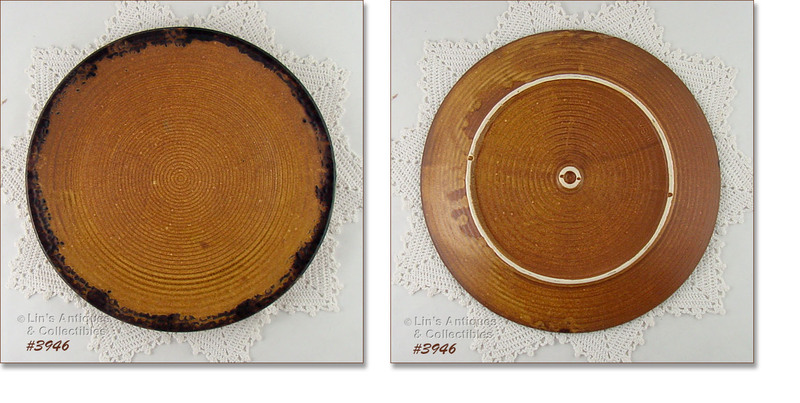 ONE HAS A GLAZE RUB/MISS ON RIM EDGE AND A PLACE ON THE HANDLE THAT FEELS AS IF IT DIDN’T RECEIVE CLEAR OVER-GLAZE. THE OTHER MUG HAS A COUPLE NON-GLAZE/COLOR PLACES ON RIM EDGE AND THE BOTTOM DRY RING HAS AN EXTRA PIECE OF FIRED ON POTTERY THAT DIDN’T RECEIVE COLOR (DOESN’T AFFECT MUG IN ANY WAY). NICE MUGS, NICELY PRICED TO REFLECT IMPERFECTIONS. THERE ARE 4 MCCOY CANYON MUGS IN THIS LISTING! THEY ARE IN WONDERFUL CONDITION WITH SOME TYPICAL GLAZE MCFLAWS – 3 HAVE SOME ROUGHNESS IN THE GLAZE ON HANDLES AND ONE HAS THIS SAME ROUGHNESS AT THE BASE THAT FEELS AS THOUGH THEY DIDN’T RECEIVE CLEAR OVER-GLAZE IN THOSE AREAS. THE ONLY “USE” EVIDENCE I COULD SEE IS A 1/16” GLAZE DING ON A BOTTOM BASE EDGE OF ONE MUG AND 2 ON ANOTHER BASE EDGE. THESE ARE NICE, USABLE MUGS AND ARE PRICED TO REFLECT THEIR NOT BEING IN MINT/EXCELLENT CONDITION. EXCELLENT CONDITION MCCOY PITCHER! THIS ONE IS FROM THE PRETTY CANYON DINNERWARE LINE. IT MEASURES 6 ¾” TALL AND BOTTOM IS MARKED 1429, MCCOY, LANCASTER COLONY (MARK), USA. ANOTHER SET OF 4 MCCOY CASSEROLES FROM THE CANYON DINNERWARE LINE! THESE ARE THE FRENCH STYLE (ROUND STICK TYPE HANDLES) AND BOTTOMS ARE MARKED 7054, MCCOY, LANCASTER COLONY (MARK), USA. 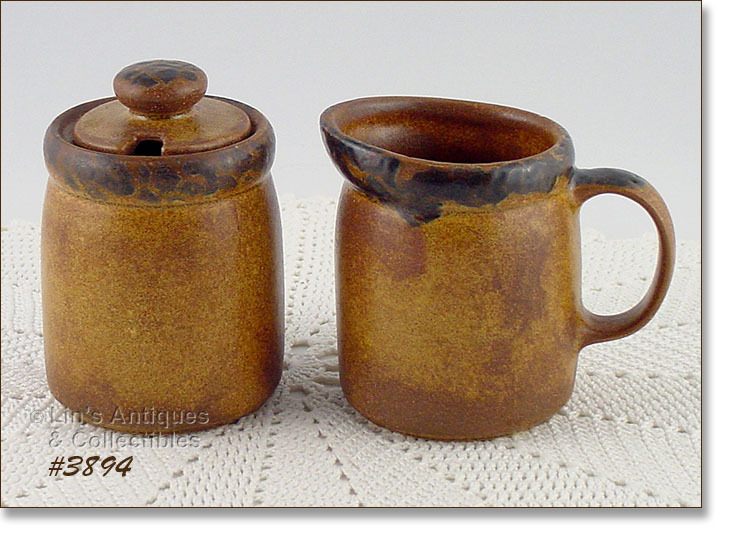 THIS SET IS IN EXCELLENT CONDITION WITH TYPICALLY MCFLAWS – UNEVEN GLAZE, A GLAZE SKIP ON ONE RIM EDGE, AND ONE HAS A NON-GLAZE/COLOR DOT “POOL” THAT POPPED. A COUPLE OF THESE IMPERFECTIONS APPEAR TO BE “USE” EVIDENCE – THEY ARE NOT, THEY’RE JUST MCFLAWS AND ARE NOT DETRIMENTAL. EXCELLENT CONDITION MCCOY INDIVIDUAL SIZE CASSEROLES! THIS IS A SET OF 4 FROM THE PRETTY CANYON DINNERWARE LINE AND THEY ARE THE FRENCH STYLE CASSEROLES (ROUND HANDLES). BOTTOMS ARE MARKED 7054, MCCOY, LANCASTER COLONY (MARK), USA. EXCELLENT CONDITION SHAKER SET FROM MCCOY’S PRETTY CANYON DINNERWARE LINE! SHAKERS HAVE GORGEOUS COLOR WITH THE MORE SMOOTH (NOT TEXTURED) FINISH. 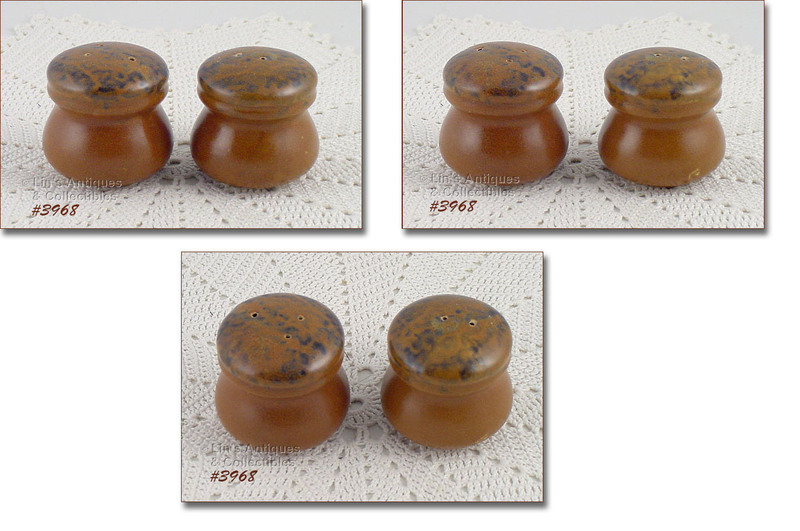 THEY MEASURE 3 ½” TALL AND HAVE THE ORIGINAL PLASTIC STOPPERS. EXCELLENT CONDITION COVERED BUTTER DISH FROM MCCOY’S CANYON DINNERWARE LINE! BOTTOM IS MARKED: MCCOY, 7013, USA. SUPER! THIS LISTING HAS 4 INDIVIDUAL SIZE CASSEROLES FROM MCCOY’S CANYON DINNERWARE LINE! BOTTOMS ARE MARKED: 7054, MCCOY, LANCASTER COLONY (MARK), USA. THEY ARE IN EXCELLENT CONDITION WITH SOME TYPICAL MCFLAWS (UNEVEN GLAZE, ETC). VERY NICE! EXCELLENT CONDITION MCCOY SERVING BOWL FROM THE PRETTY CANYON DINNERWARE LINE! BOWL MEASURES 2 5/8” TALL, 7 ¾” DIAMETER. BOTTOM IS MARKED: 1423, MCCOY, LANCASTER COLONY (MARK), USA. THIS LISTING HAS AN EXCELLENT CONDITION DINNERWARE SERVICE FOR FOUR FROM MCCOY’S PRETTY CANYON LINE! THERE ARE 4 DINNER PLATES, 4 BREAD/SALAD PLATES, 4 SOUP BOWLS, 4 SAUCERS, AND 4 CUPS. VERY PRETTY COLORS! EXCELLENT CONDITION UNMARKED CANDLEHOLDERS FROM MCCOY’S PRETTY CANYON DINNERWARE LINE! 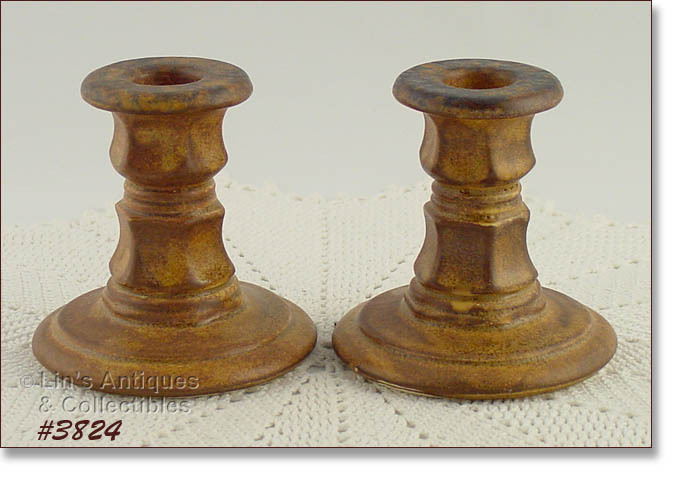 CANDLEHOLDERS MEASURE 3 ¾” TALL. SUPER ADDITION TO A CANYON COLLECTION! EXCELLENT CONDITION MCCOY GRAVY SERVER! IT’S FROM THE CANYON DINNERWARE LINE AND HAS GORGEOUS COLOR. BOTTOM IS MARKED: 7128, MCCOY, LANCASTER COLONY (MARK), USA. 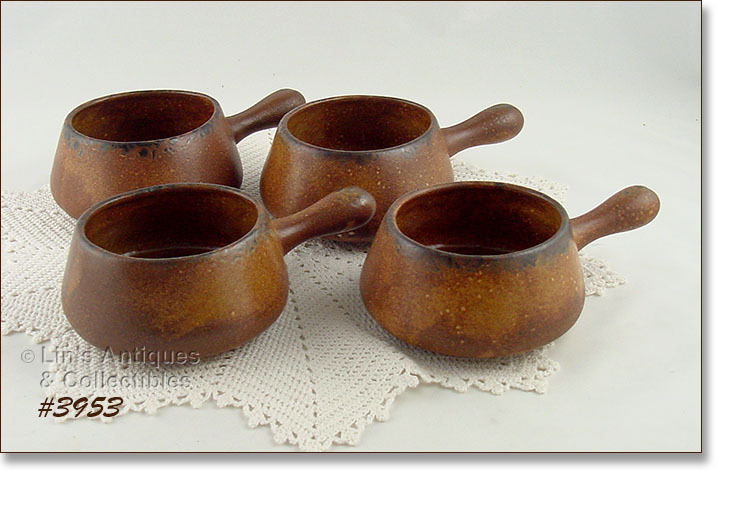 SUPER LISTING – A SET OF 4 DOUBLE HANDLE SOUP BOWLS FROM MCCOY’S CANYON DINNERWARE LINE! BOWLS ARE MARKED MCCOY, LANCASTER COLONY (MARK), USA AND ARE IN EXCELLENT CONDITION – APPEAR NEW AND UNUSED!